Fans of Back to the Future, Primer and The Butterfly Effect need look no further than Steins;Gate in order to get their time travel narrative fix. This anime series is quite possibly the most exhaustive exploration of the ramifications of time travel I’ve ever seen. The most amazing part of Steins;Gate is just how much genre hopping the show does throughout its 25 episode run. In the beginning, it’s like a sitcom version of Primer. We have a group of young people, headed by self-styled mad scientist, Rintarō Okabe (Mamoru Miyano), who are in their tiny apartment, scrounging together bits and pieces in an effort to create the inventions of the future. 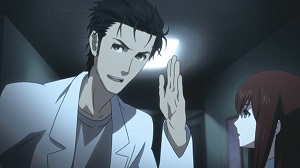 Okabe is perpetually dressed in a labcoat, having pretend conversations with covert agents on his mobile, and cackling maniacally whenever he gets the chance. Mayuri Shiina (Kana Hanazawa) is his childhood friend and a typical Japanese kawaii innocent, perpetually in good spirits, and Daru Hashida (Tomokazu Seki ) is Okabe’s high school buddy and experienced computer hacker. Together the three of them manage to create a time machine of sorts. The time machine in question is a microwave, and it has the uncanny ability to send text messages into the past. It’s a subtle means of affecting the future, and one of the more realistic presentations of time travel we’ve seen on screen. Before long, the group are sending lottery tickets into the past in an attempt to make themselves rich. The first half of series is along these lines – always entertaining but rather shallow. But it’s at the halfway point that everything begins to change. I won’t spoil it for you here, but rest assured that the type of plots twists you’ve seen in the likes of ‘The Sound of Thunder’ and its various incarnations are taken to the extreme. Ethical quandaries, temporal paradoxes and grandiose tragedy are all on the menu, and Steins;Gate goes through all of them one by one. The series features what would have to be a record number of female characters this side of Strike Witches. 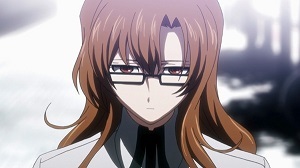 As well as Mayuri, we have the scientific prodigy that is Kurisu Makise (Asami Imai), a student of neuroscience. There’s also the shy and secretive Moeka Kiryū (Saori Gotō), who communicates only through text message, and Ruka Urushibara (Yū Kobayashi), a boy who desperately wishes he was born a girl. Finally, we have Suzuha Amane (Yukari Tamura), who came to town looking for her long lost father. They are a disparate bunch, but the variety makes for some wonderful character interactions and a balanced narrative. For series that starts out feeling a little flippant, I can assure you that there are some incredibly dramatic moments in the second half. The narrative takes full advantage of the time travel conceit, and we are subject to quite a bit of circular insanity, as tragedy is piled upon revelation over and over again. The writing really is stunning, and the time travel mechanic means that the script can have its cake and eat it too, again and again. The animation isn’t as flashy as some other shows out there. There’s only one 3D element in the entire series, that of an oscillating fan, and we see it way too often. The colour palate is deliberately washed out also. In fact, the whole show is oversaturated, as if you’d walked from a darkened room to bright sunshine outside, white being the dominant colour. There isn’t much in the way of special features on the Blu-ray aside from audio commentaries, but to have the entire series in one box set is a blessing, as this is really a show you need to watch in several big gulps, rather than spreading it out. A genius piece of science fiction in more ways than one, Steins;Gate is a constantly surprising and memorable experience. It perhaps overstays its welcome, insofar as the first half could have been slightly abbreviated, but that only means when the proverbial hits the fan, it’s all the more shocking. Highly recommended. Steins;Gate Series Collection is available now on Blu-ray and DVD from Madman. This entry was posted in TV Series and tagged Anime, Comedy, Romance, Science Fiction, Tragedy, TV series by Stuart Wilson. Bookmark the permalink.